Lesley Douglas, who has announced her resignation as controller of BBC Radio 2 and BBC 6 Music, started her broadcast career in 1986. Born in Newcastle in 1963 she gained a degree in English at Manchester University. Her first job was a production assistant in a BBC research department. Later that year she moved to the David Jacobs show on Radio 2, before becoming a promotions assistant. In 1988 she became a producer in the music department working on programmes such as the Gloria Hunniford show, the Ken Bruce show and Brian Matthew's Round Midnight. Two years later she returned to promotions, this time as a producer. She was eventually promoted to editor of Radio 2 presentation and planning in 1993. 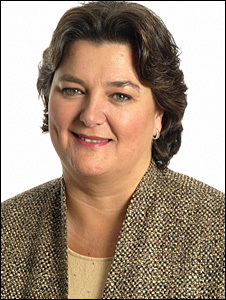 Douglas remained in the role for four years before she was made managing director of Radio 2 and three years later she was appointed head of programmes for the network. She was appointed controller of both Radio 2 and 6 Music in 2003, succeeding James Moir. Her role was expanded in May last year when she was appointed the BBC's first controller of popular music. She was responsible for co-ordinating the full range of popular music output produced across the various BBC platforms. Since Ms Douglas took over as the Radio 2 controller, the station has been voted the Sony UK Radio Station Of The Year in 2005. It was also named station of the year at the The Music Week Awards in 2006 and 2007. The digital station 6 Music was voted best radio station at the UK 2005 BT Digital Music Awards. In 2004 Ms Douglas was awarded the top prize at the music industry woman of the year awards in 2004. She is a trustee of BBC Children in Need and sits on the Radio Times Advisory Panel. Ms Douglas is also a fellow of the Radio Academy and has chaired the Radio Festival Steering Committee on two occasions. She is currently Vice Chair of the Radio Academy. Ms Douglas has been presented with an honorary fellowship by the University of Sunderland.